Frances Elizabeth Caroline Willard (September 28, 1839 – February 17, 1898) was one of the most prominent social reformers in nineteenth-century America. She held the office of president of the Woman's Christian Temperance Union almost twenty years. Willard fought for woman's suffrage, women's economic and religious rights, prison reforms, education reforms and labor reforms. She brought the WCTU worldwide recognition with her dedication. Willard was born in Churchville, New York to Josiah Flint and Mary Thompson Hill Willard. She spent most of her childhood on a farm in Wisconsin. Willard was well known as a tomboy; she kept her hair short and insisted on being called Frank as a nickname. She had twelve siblings and her parents both being teachers were determined that all their children would be educated. Willard left home at age seventeen to live with an aunt in Milwaukee. She attended the Milwaukee Female College for one year then transferred to Northwest Female College at Evanston, Illinois, where she graduated as valedictorian. After graduation she became a teacher at several colleges and seminaries in Illinois including Northwest Female College and in 1871 became that college's president. Willard resigned her position as president of Northwestern to accept the position of national corresponding secretary of Women's Christian Temperance Union. Having spoken and written extensively on the temperance movement she was considered the most logical choice. She also used her position to promote women's suffrage. Since childhood she felt many of the injustices toward women including their being denied the right to vote in political elections. Willard was named president of the Chicago Women's Christian Temperance Union in 1874. She became the national president of WCTU five years later. Then finally her dreams were realized when she helped organize the World's WCTU. The first world's convention was held in Boston in 1891. Willard was elected president. She traveled extensively spreading the word to women all over the world. Willard's health began to fail after her mother's death in 1892. She wanted to visit her birthplace in Churchville, New York one last time. It was in here that Willard gave her final public speech. She returned to New York City and began planning a trip to England when she became seriously ill with influenza. She died in the Empire Hotel on February 17, 1898, at the age of 58. Her tireless efforts for women's suffrage and prohibition included a fifty-day speaking tour in 1874, an average of thirty thousand miles of travel a year, and an average of four hundred lectures a year for a ten year period. Her influence was instrumental in the passage of the Eighteenth (Prohibition) and Nineteenth (Women Suffrage) Amendments to the United States Constitution. She wrote Woman and Temperance, Nineteen Beautiful Years, A Great Mother, Glimpses of Fifty Years, and a large number of magazine articles. She founded the magazine The Union Signal, and was its editor from 1892 through 1898. Among her other honors Willard was the first woman represented among the illustrious company of America’s greatest leaders in Statuary Hall in the United States Capitol, she was national president of the collegiate society Alpha Phi in 1887 and the first dean of women at Northwestern University. In 1940 she was portrayed on a United States postage stamp. A dormitory at Northwestern University, Willard Residential College, was named after her. The Evanston, Illinois home where she lived and worked from 1865 until her death in 1898 has been preserved and made into a museum in her memory. She was publicly honored many times during her life by persons of prominence in government and society in many lands. 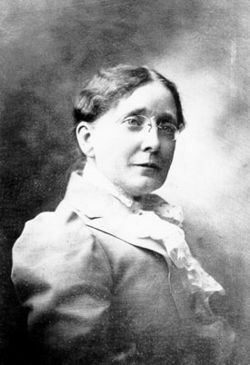 Carrie Chapman Catt, Pi Beta Phi, said of her, "There has never been a woman leader in this country greater than nor perhaps so great as Frances Willard." Woman and Temperance, or the Work and Workers of the Woman's Christian Temperance Union. Hartford, CT: Park Pub. Co., 1883. "Frances E. Willard," in Our Famous Women: An Authorized Record of the Lives and Deeds of Distinguished American Women of our Times. Hartford, CT: A.D. Worthington, 1884. Nineteen beautiful years, or, sketches of a girl's life. Chicago: Woman's Temperance Publication Association, 1886. Glimpses of fifty years: the autobiography of an American woman. Chicago: Woman's Temperance Publication Association, 1889. Do everything: a handbook for the world's white ribboners. Chicago: Woman's Temperance Pub. Association, c. 1895. How to Win: A Book for Girls. New York: Funk & Wagnalls, 1886. Reprinted 1887 & 1888. Gordon, Anna A. The Beautiful Life of Frances E. Willard. The Woman's Temperance Publishing Association, 1898. All links retrieved April 21, 2017. This page was last modified on 21 April 2017, at 14:33.